Here are things I love: fried chicken, french fries, tempura, onion rings, and when it comes to low sodium living, being wrong. Which has nothing to do with being dipped in hot oil…thank goodness. My great mistake begins with yogurt. For years, I have avoided it since many dairy products are high in sodium. But with my recent travels, I started contemplating the yogurt compromise. At airports and on-the-road, low sodium food is scarce. I tend to look for things like steamed white rice, fresh fruit, and hard boiled eggs to keep me fueled and my stomach quiet. But often, even these items can be difficult to find and are generally not very satisfying. Yogurt, however, is pretty much everywhere. Plentiful, if you will. From Walgreens to Whole Foods and all the corner stores in between, you are almost guaranteed to find a carton of the stuff. And after years of giving it the cold shoulder, I decided to take a second look. Most yogurts (excluding the soy or coconut based products) fall in the 80 to 100mg of sodium per container range, which is why I always left them on the refrigerated shelf. But if you consider that an egg has 70mg of sodium, then suddenly, substituting yogurt for a three-egg omelette (especially when you are in a food pinch) is perfectly acceptable. Here’s the best part, upon further inspection, there are even some Greek yogurts that fall in the 30 to 40mg of sodium per container range. Less than a third of a can of Coca Cola. And the FAGE brand – shown above – comes in some super exciting flavors, like honey and cherry pomegranate. Low in sodium, not in taste. So on this Hump Day, as you race around town and realize that you haven’t had anything to eat, do me a favor and skip the banana/coffee “in-a-crunch” lunch – which is what I am eating as I write this and trust me, it is not that exciting. 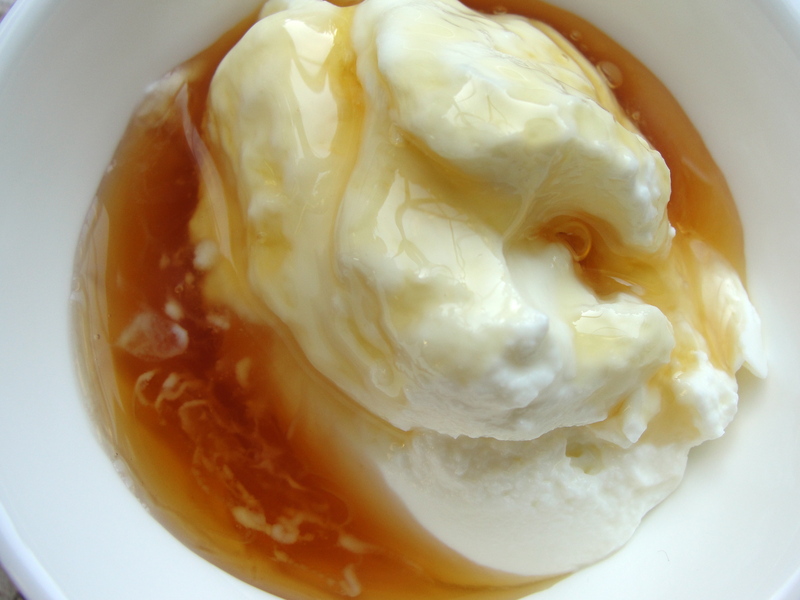 Treat yourself to spoonfuls of yogurt and sugar instead, because, as it turns out, you can. This yogurt addict couldn’t agree more. I have a bowl most mornings, usually with walnuts crumbled in and a sweetener swirled in–my recent favorite is Happy Girl Kitchen Chili Apricot, which we’re going to be carrying soon at Bi-Rite Market where I work. My favorite yogurt preparation though is the way they do it in the middle east– savory combinations of plain yogurt with tomatoes, cukes, olives, olive oil, chili flakes….so fresh. None of the yogurts I have ever bought have sodium in them. Is this an US thing? You bring up a really interesting point, Martha! While I was out of the states I did notice that most yogurt had really low sodium content. This could be for two reasons: 1) differences in labeling regulations or 2) and probably the more likely reason, we process most of our milk (and animal) products with a lot of additives. So I think you touch upon something really important – I have found that the more sustainable, organic, small-farm the product is, the less salt or sodium there is as well! Thanks for you thoughts…where are you located? Wait, it is just because I always eat plain yogurt.